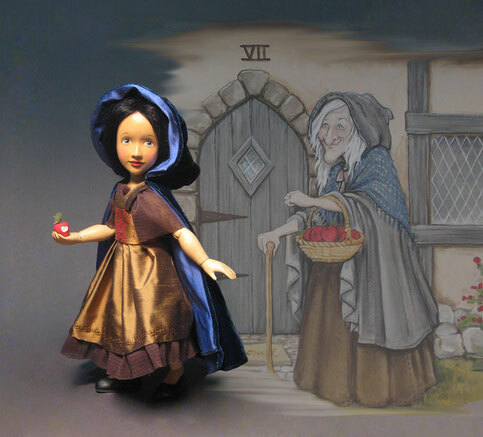 The timeless story of Snow White is captured in this 13" beautifully carved rendition. Snow White has an exquisitely hand painted face, gorgeous mohair wig and is dressed in a handmade silk embroidered dress. She holds the poisoned apple from the evil queen who is pictured in the 20" x 24" canvas backdrop. The Dwarves cabin pictured in the background. 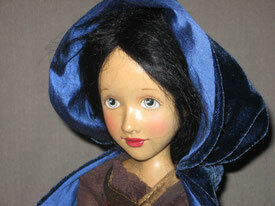 We have only one 13" Snow White with poisoned apple and backdrop available immediately.